Planning a trip to Houston, Texas? There are so many great places to visit and so many amazing things to see in the beautiful city of Houston. Houston is a diverse area with something to offer everyone. Whether you’ll be visiting for a day, a week, or browsing Houston homes for sale to visit indefinitely, there are some things you should know about the city beforehand. Being nothing but one large melting pot, you can find people from all different cultural backgrounds and ethnicities living in and visiting Houston. As a matter of fact, Houston’s population is one of the most ethnically diverse in all of America! This inclusive city is not only accepting but welcoming to people of all backgrounds. This is great for those looking for somewhere to fit in but also for everyone in the city in general. The reason for that is the diversity in people also brings a large diversity in food. You can dine around the world and taste all of its many flavors without traveling outside city limits. If you’re the artsy or enjoy day trips to the museum, Houston is the place to be. The city’s world-class art district provides an amazing variety of museums and exhibits that are sure to intrigue anyone, from professional artists to hobbyists to historians. With over 20 museums and community centers, all within walking distance, you can fill an entire week or more visiting art exhibits and museums. Not only will you have the opportunity to observe art and exhibits, but you will learn something new and educate yourself in the process. It’s a win-win! No car? No problem! Houston may be a large city but it is actually one of the easiest to navigate. The city has a railway that will take you to just about any destination in the city (well, within walking distance at least). If you’re looking for more of a direct route to your destination, Houston has a large number of taxis and even ride-sharing options for those looking to cut costs. If you are trying to be eco-friendly or you are looking to enjoy Houston's beautiful weather while touring the city, maybe think about renting a bike. There are walking and bike routes throughout the entire city, making it very pedestrian friendly. 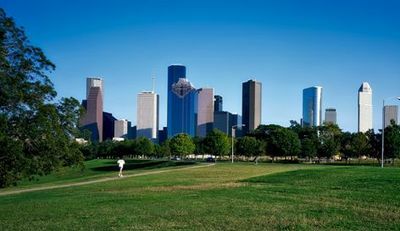 Oftentimes when you think of a city, you think of large buildings, busy streets, and noise, which Houston does have, but all stereotypes aside Houston is actually one of the greenest cities in America. With beautiful tree-lined parks throughout the city it’s easy to escape the hustle and bustle of city life. Some of the parks you can visit while in Houston include Hermann Park (which is the home to the Houston Zoo and Japanese Garden), Discovery Green Park, or Buffalo Bayou Park. Whichever park you choose to stroll through or hangout in after walking through the busy city, you’ll be able to get a feel for how balanced the city truly is.